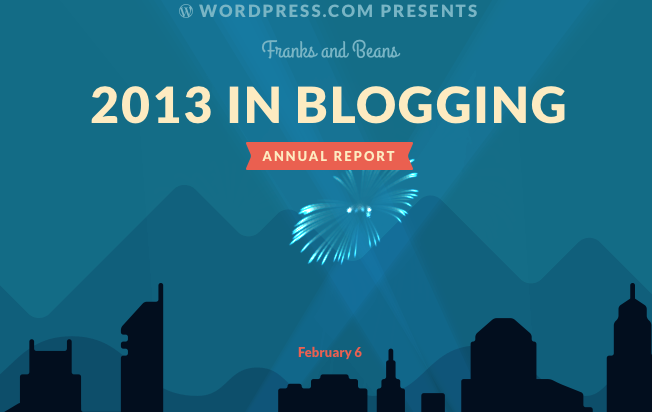 WordPress put together an annual report for this blog. Because it is full of fun animations and pretty-looking text, I’ll put a link here in this post. Here’s the rundown, for those short on time: NO ONE READS THIS BLOG! One of the search term phrases most used to find this blog was “Bronson Pinchot shirtless”. Who is searching for that? Come on. 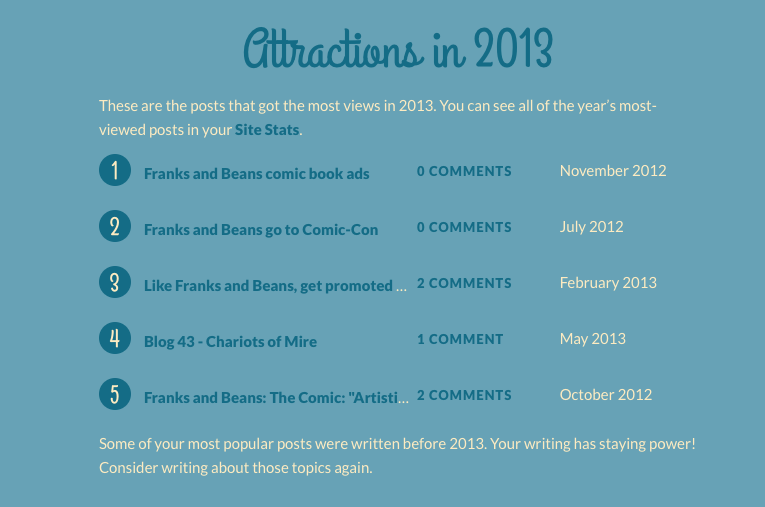 So here’s my Franks and Beans New Years resolution: to find a bigger audience for Franks and Beans in 2013. We can beat 1400 page views with no problem. At least, we SHOULD beat 1400 page views in a year. I think it can happen. In the meantime, if you enjoy looking at pictures of and involving me, check out the automatically generated WordPress information below! One of the reasons that Franks and Beans was created was to air episode two, “Perfect”. 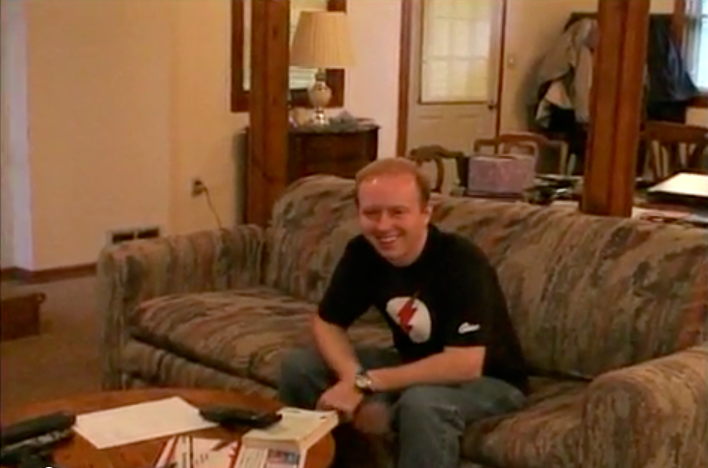 Its inception was born out of distance and a longing to reconnect with friends through visual expression, something that both Larry and I have been involved with, in different capacities, for much of the last decade. This isn’t to say that either of us necessarily felt like we were missing something. Sometimes the world looks perfect – nothing to rearrange. But that doesn’t mean that Franks and Beans hasn’t become a welcome outlet for our creative energies. It doesn’t mean that it hasn’t allowed us to take what we had and add something new to the mix. I mean, after all, sometimes you just get a feeling like you need some kind of change. The challenges of creating a new program are many in any circumstance, and Larry and I have our share – from having to do most everything ourselves to our obvious budgetary restraints – but I’m happy to say that we’ve taken these challenges and have made most of them work to our advantage. It’s as if we looked at this daunting task and said that no matter what the odds are this time, nothing’s gonna stand in our way – and we’ve certainly reaped the rewards that have come as a result. By this I’m not just talking about spreading our particular brand of humor to the far reaches of the globe (though that does have its own appeal to it) or in hearing from people who have seen the show and have enjoyed it. No, the show has taken on its own life with the two of us, as if it is its own person. And that’s encouraging, because we each have a great deal of passion for it – a flame in our hearts, if you will, like a long lost friend. And because of this, we both can take solace in the fact that while we are of course the custodians behind this Internet program, Franks and Beans can resonate to people who have never met us – each vignette can mean something different to someone else, but even so, there’s interpretation, there’s understanding, there’s enjoyment at different levels with each view an episode of ours gets, and I’m comforted by that. It’s like, from a metaphorical standpoint, every dark street has a light at the end! While the above follows an obvious pattern, everything that I wrote it true – episode two, “Perfect”, IS one of the reasons that Franks and Beans was created. In fact, it’s one of the first thoughts I had in mind when I contacted Larry with the idea of creating some skits for online viewing more than a year ago. And if one of your friends (you have friends, right?) called you up and asked you, “I’ve been hearing a lot about this ‘Franks and Beans’ thing lately…what’s it all about?”, I think that this episode would be the perfect answer. Larry and were both born in the early years of the 1980s, and as anyone from that particular period can attest, one thing that connects us is the TGIF television lineup. Regardless of race, gender or religious preferences, if you grew up in the 1980s you inevitably watched shows like Family Matters or Step-By-Step (which was Patrick Dufferific). If you are anything like me, you not only watched shows such as these, but you also grew to hate them and their cookie-cutter plotlines and asinine humor over time. But even with these obvious flaws, I still relate to them, still feel an attachment to Bob Sagat’s sugar-sweet “aw shucks” humor or Urkel’s litany of catch phrases. One show, airing a little earlier than many of the TGIF mainstays, has stuck with me more than many, though, and that is without a doubt Perfect Strangers. I don’t know what exactly did it for me, but Perfect Strangers has either enriched my upbringing or scarred me for the rest of my existence, because I couldn’t forget its particular brand of sitcom-ness if my life depended on it. Looking back on the show, I wonder if the humor was as simple as it seems now – are we really just laughing at Balki because of his foreign, eastern European antics? Is Perfect Strangers a reflection of American perception in the 1980s? Surely, it had to be more than that, but at age seven, I was probably just taken in by lines like “Get out of the city!” even though I didn’t even understand that there was a proper phrase that the character just couldn’t grasp. No matter what mark Perfect Strangers has left on society, it has indelibly left its mark on me, and episode two of Franks and Beans is nothing more than a love note in regards to that fact. Yes, Larry catches me singing and I display embarrassment both for being caught and for being caught signing THAT song. But the catch, the subtle nod, is that Larry remembers, Larry sings, Larry can’t escape Perfect Strangers any more than I can. It’s something that we all have to live with. Plus, Larry’s character was totally named after Larry Appleton, not Larry Franks, as he would lead you to believe. How did he get his hair to curl like that?! (This final paragraph makes absolutely no sense anymore, but I’m leaving it is originally was…for…uh…posterity. It’s like an archaeological dig – you don’t always understand everything you find at first. I’ll probably just delete paragraphs like these in the future, like when you’re on an archaeological dig but some of the stuff you find gets lost in a moment of shortsighted rage. – JM) As you’ve noticed, there are some new episodes of Franks and Beans online. You may be wondering why there aren’t any blogs for those particular episodes. Firstly, get off my back! Secondly, I’m working on them. We’ll catch up in the next few days. So keep an eye out for those, and check back next Monday for another new episode! We’re hoping to put together a nice long run. If only Bronson Pinchot sounded this good. Larry catches Jeff in the act.